If a broken pipe is causing your basement to flood, you need to turn off the water before you worry about cleaning up. It’s the same with e-mail: before worrying about what’s already in your inbox, you should do whatever you can to decrease the volume of incoming messages—particularly spam, sales announcements, and other nonessential communications. Reports by antispam companies put the amount of spam sent in 2007 at anywhere from 71 percent to an astonishing 97 percent of all e-mail messages. So if you haven’t already taken steps to keep spam out of your inbox, that should be your first priority. 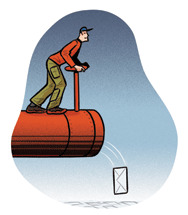 Start by turning on your e-mail client’s junk-mail filter. 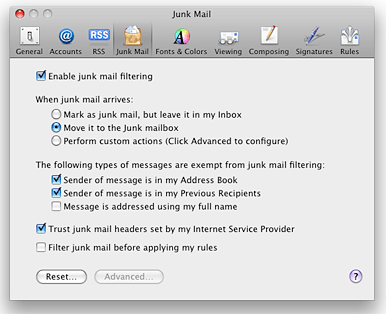 In Mail, choose Mail: Preferences, click on Junk Mail, and make sure Enable Junk Mail Filtering is selected. Select the Move It To The Junk Mailbox option, but deselect Message Is Addressed Using My Full Name (many spam messages do use your full name, and you don’t want to let those through). Also select the Trust Junk Mail Headers Set By My Internet Service Provider option. Mail’s Junk Mail settings prevent spam from cluttering up your inbox. In Entourage, choose Tools: Junk E-mail Protection, click on the Level tab, and make sure the level is set to High. If you continue to receive a lot of spam in your inbox, you may be better served by a third-party antispam utility such as C-Command’s excellent SpamSieve ($30; [ ), which employs sophisticated tactics to separate the wheat from the chaff. (For other tricks that keep spammers at bay, see “Stop Today’s Spam”). When you make online purchases, join social networking sites like Facebook, or do any of numerous other activities on the Web, you may see a check-box option asking whether you’re willing to receive e-mail from that company or site. These sorts of messages aren’t spam because you (at least implicitly) agree to receive them—but they can still clutter your inbox. Get in the habit of unchecking that box if you see it on a Web form. And if you forgot to opt out initially, do so the next time you hear from one of these companies (which often requires going to the Web site, logging in, and changing your contact preferences). For sites that don’t provide any way to opt out, I’ll show you how to set up a rule that removes those messages from your inbox on Day 2. Just about everyone has a friend or relative who loves to forward jokes, funny pictures, and chain letters to everyone in his or her address book. Although such people are undoubtedly well-intentioned, these sorts of messages can wreak havoc with an otherwise clean Inbox. If you think your friend or relative will be understanding, send a polite, thoughtful, and perhaps self-effacing message explaining that you really do enjoy hearing from them but that you’re going crazy with e-mail overload—so could they maybe help you out by going a bit easier on the random jokes, pictures, and videos? Or, if you think that’ll make unnecessary waves, you can set up a rule to funnel such messages into a special mailbox you’ll look at only when you truly have time (more on this tomorrow). In some situations, using iChat or another instant messaging program is faster and more efficient than e-mail—and it has the terrific side-effect of reducing the number of messages in your Inbox. Chat is ideal for conversations involving a lot of back-and-forth but not a lot of detail. It’s also great for quick or urgent queries—as long as the other person is online. Mail 3 makes it easy to see when people in your iChat Buddy list are available; the program displays a colored dot, representing their iChat status, next to senders’ names. (If you don’t see this, open Mail’s preferences, click on the Viewing tab and turnon the Show Online Buddy Status option.) If the contact is available and you have a quick question or response, try iChat instead of e-mail—and encourage other people to do the same. Most e-mail servers have an out-of-office or vacation feature that can send a canned reply to your correspondents when you’re gone for an extended period. But these auto-replies can be useful even when you’re not basking on the beach. If you’re facing an important deadline or simply don’t have time to send out replies for a day or two, craft a brief autoresponse saying that you’ve received the message but that your reply may be delayed. Your correspondents will be reassured that you’ve received their notes, and will be less likely to send follow-up messages that’ll just make matters worse. If you use .Mac for e-mail, go to .Mac, log in, click on the Mail link, and then click on the Preferences link. Select the Other tab, turn on the Automatically Reply To Email When It Is Received option, and then enter a message in the field provided. When you’re done, click on Save. If you use Entourage with an Exchange Server account, select your account in the folder list. 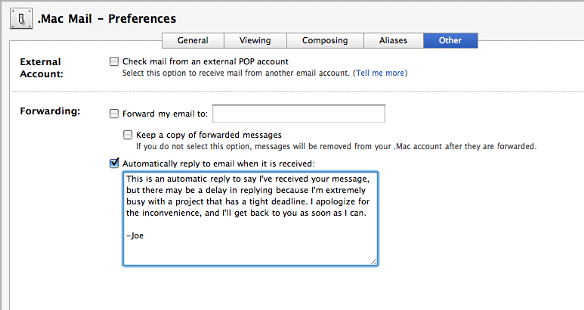 Choose Tools: Out Of Office, click on Send Out Of Office Messages, and then enter your message in the Reply to Message With field. By setting up an automatic reply to your .Mac address, you can inform senders that you got their message but can’t reply immediately. For Gmail, click on the Settings link, and then click on General. Select Vacation Responder On, enter a subject and message, and click on Save Changes. If you use another e-mail provider, check their Web site for instructions. Server-based out-of-the-office messages are nice because they work even when your computer is off, and they usually keep track of who has received an automatic reply so that a single address doesn’t get more than one. (In the case of Gmail, a given address will get an autoreply no more often than once every four days.) But if your e-mail provider doesn’t offer any sort of out-of-office feature, you can achieve something similar (though without the one-reply-per-person feature) by using a mail rule.